Corazón in 2009. This jaguar, living near the U.S.-Mexican border, was killed and burned in February, sparking calls for conservation reform. Photo courtesy of the Northern Jaguar Project/Naturalia. 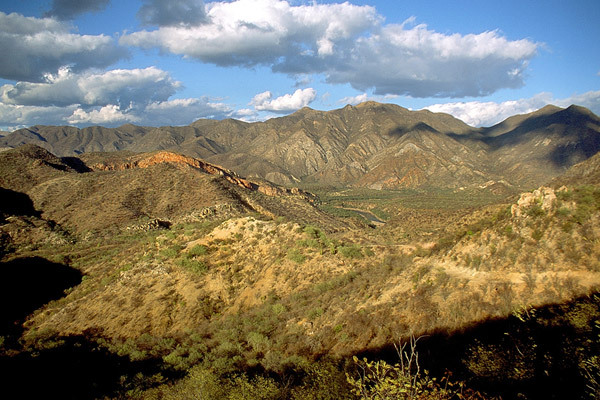 View of the Northern Jaguar Reserve. Photo by: Oscar Moctezuma. Corazón as a cub in 2006. Photo courtesy of the Northern Jaguar Project/Naturalia. Medellín reported to mongabay.com that PROFEPA, the Mexican version of the Environmental Protection Agency, seems unable or unwilling to seek justice. Despite finding Corazón’s bones and destroyed collar (see photo) at her last recorded location, PROFEPA recently dropped her case. 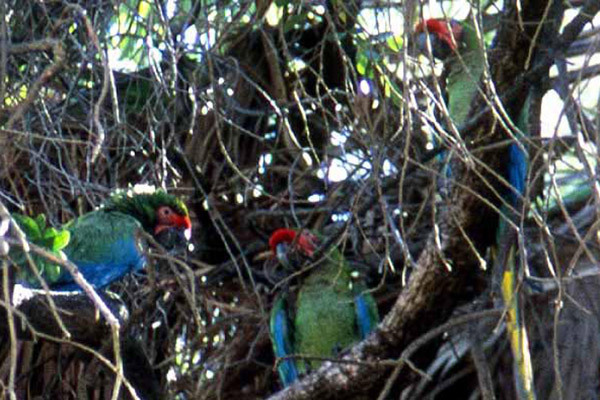 The Northern Jaguar Reserve is also home to other threatened species, including military macaws (Ara militaris), which are listed as Vulnerable by the IUCN Red List. Photo by: Rick Williams. Corazón with a javelina kill in 2012. 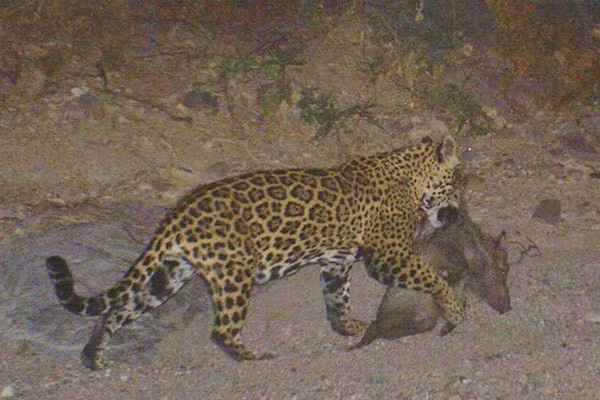 Scientists believe that if prey is built up, jaguars may not target livestock. Photo courtesy of the Northern Jaguar Project/Naturalia. Last photo of Corazón taken at the Northern Jaguar Reserve, showing her tracking collar. Photo courtesy of the Northern Jaguar Project/Naturalia. 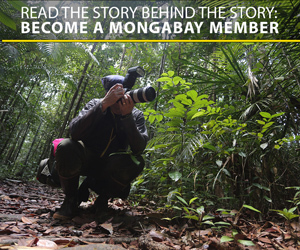 “[A] small group of conservationists and biologists formed NJP in 2003 because we saw a great opportunity to start a reserve and partner with Naturalia for a relatively small expense, compared to conservation purchases in the U.S.,” Hadley told mongabay.com. Moreover the reserve’s “Jaguar Guardians” maintain an extensive network of motion-triggered cameras, inventory the ecological health of the land and water, and work with ranchers to support local wildlife. Military macaw nesting cliffs, which are adjacent to the Northern Jaguar Reserve. 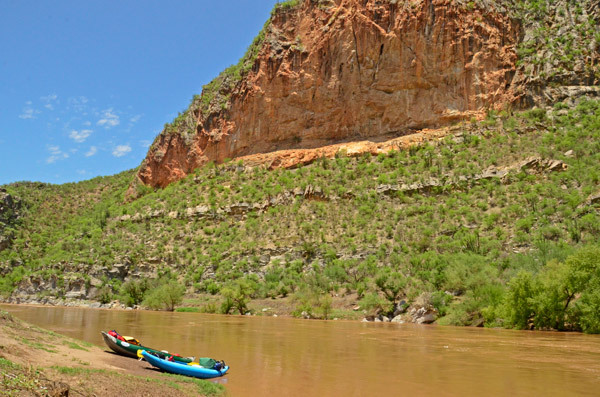 The Río Aros is northern Mexico’s longest undammed river and shares frontage with the Northern Jaguar Reserve. Photo by: Aaron Flesch. Jaguars are found from northern Mexico (with a few in the Southwestern U.S.) to northern Argentina. They are the largest cats in the Western Hemisphere. Photo by: Rhett A. Butler. Many hope the gruesome death of Corazón and the anger it has caused worldwide may ironically end up producing these very things. But Medellín sees a long road ahead in the push to create better protections for wildlife. (06/03/2014) Four donors from around the world have pledged $80 million to cat conservation group, Panthera. The money will fund projects working to preserve tigers, lions, jaguars, cheetahs, leopards, snow leopards, and cougars over ten years. (12/23/2013) The majestic jaguar (Panthera onca), the largest of the New World cats, is found as far north as the southern states of the US, and as far south as northern Argentina. In the past jaguars ranged 1,500 kilometers (930 miles) further south, but their range has shrunk as habitat loss and human disturbance have increased. 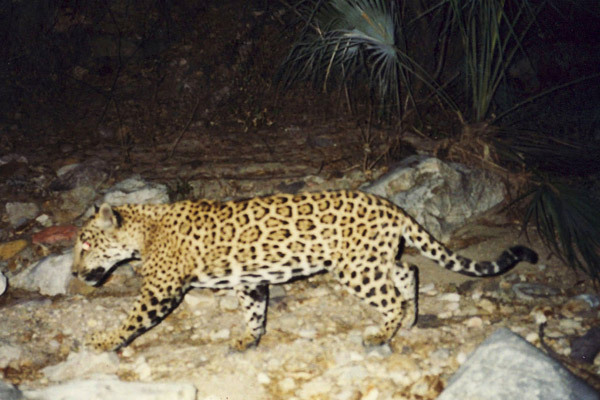 Overall, jaguars are classified as Near Threatened by the IUCN, but the level of risk facing jaguars varies by region. Populations in Argentina, at the present-day southern range limit, have previously been identified as some of the most threatened of them all. 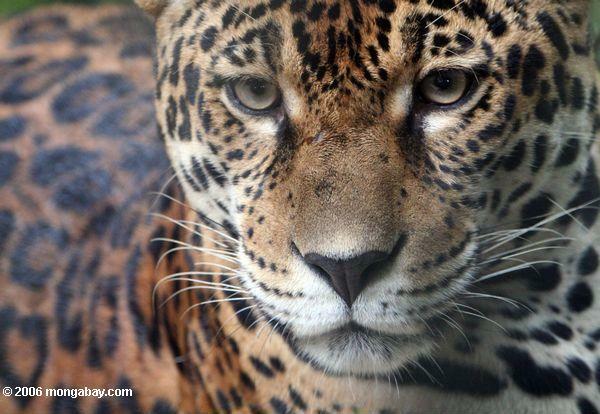 (06/24/2013) At least 60 big cats have been killed within national protected areas in Brazil during the past two years according to a recent survey published in mongabay.com’s open access journal Tropical Conservation Science. The report, which focuses on jaguar (Panthera onca) and puma (Puma concolor) populations, within Brazilian protected areas shows that reserve management and use restrictions impact the level of big cat hunting. (05/16/2013) Jaguars (Panthera onca) are the biggest cat in the Americas and the only member of the Panthera genus in the New World; an animal most people recognize, the jaguar is also the third largest cat in the world with an intoxicatingly dangerous beauty. The feline ranges from the harsh deserts of southern Arizona to the lush rainforests of Central America, and from the Pantanal wetlands all the way down to northern Argentina. These mega-predators stalk prey quietly through the grasses of Venezuelan savannas, prowl the Atlantic forests of eastern Brazil, hunt along the river of the Amazon, and even venture into lower parts of the Andes. (02/19/2013) Watching a new video by Amazon explorer, Paul Rosolie, one feels transported into a hidden world of stalking jaguars, heavyweight tapirs, and daylight-wandering giant armadillos. This is the Amazon as one imagines it as a child: still full of wild things. In just four weeks at a single colpa (or clay lick where mammals and birds gather) on the lower Las Piedras River, Rosolie and his team captured 30 Amazonian species on video, including seven imperiled species. However, the very spot Rosolie and his team filmed is under threat: the lower Las Piedras River is being infiltrated by loggers, miners, and farmers following the construction of the Trans-Amazon highway. Can ranchers co-exist with jaguars? (01/17/2013) Jaguar once roamed from the United States to Argentina, but today they’ve been eliminated from several range countries, including the United States. The chief reasons are habitat loss and direct killing by humans, putting ranchers and farmers at the heart of the issue. Both ranchers and farmers convert key jaguar habitat and kill the big cats as a threat to their livestock. However in parts of Brazil’s Pantanal, some ranchers are going about their business without killing jaguars. My Pantanal, a film by Andrea Heydlauff, Vice President of the wild cat conservation group Panthera, takes a look at one particular ranch that is helping prove that jaguars and ranchers can co-exist. (09/27/2012) Jaguar conservation has received a huge boost in the past few months both in Latin America and in the U.S. An historic agreement singed between the world’s leading wild cat conservation organization Panthera and the government of Costa Rica in addition to a new U.S. 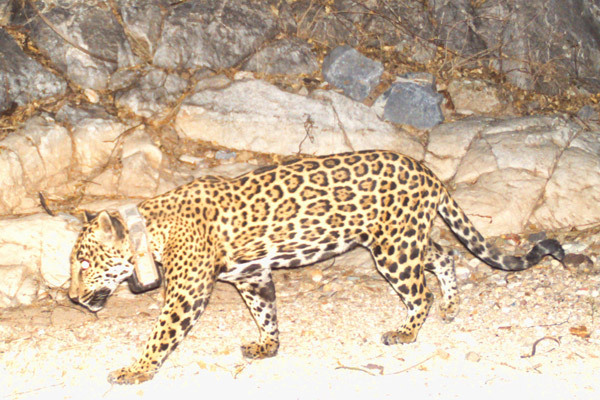 Fish and Wildlife Service (FWS) proposal bring renewed hope to the efforts to revive the iconic jaguar in its current habitat and return the cats to the American Southwest.